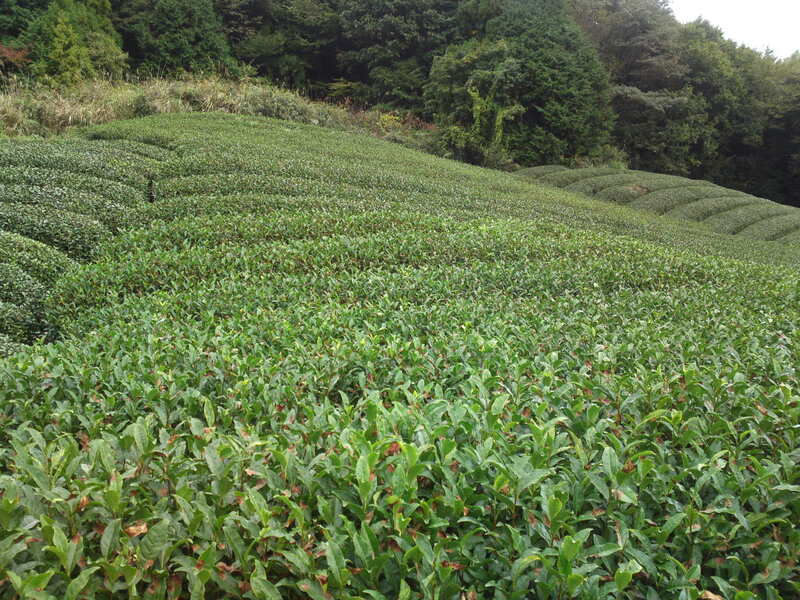 Organic Tea: Honyama Tea by Bunji Itoh at Marufuku Tea Co. Ltd.
Organic tea is still rare in Shizuoka Prefecture which produces no less than 45% of the total tea crop in Japan. 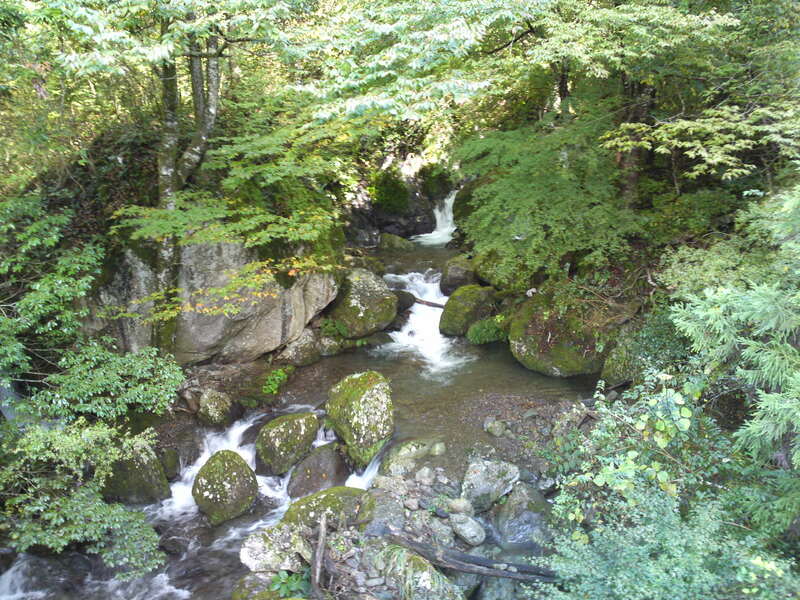 The Prefecture counts many famous brands, one of which is Honyama/本山 grown along the Abe/安部 and Warashina/藁科 Rivers across Shizuoka city up to the Japan Southern Alps. 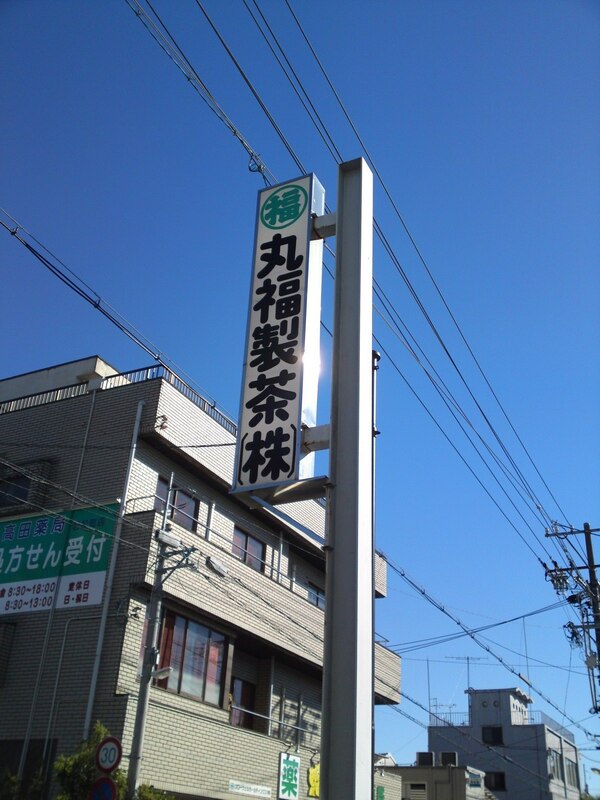 Bunji Itoh is the 3rd generation of a tea growing family and the 2nd generation at their company, Marufuku Tea Co. Ltd./丸福製茶株式会社. 10 years ago he pioneered organic tea in one of his tea fields in Hirano, up the Abe River near Utougi/有東木, the birthplace of wasabi. 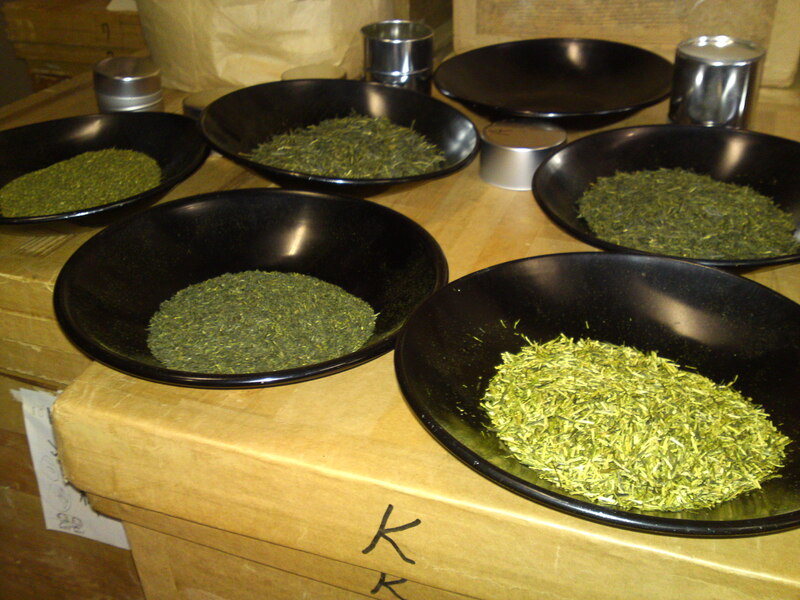 Last year the Shizuoka Prefecture decided to promote its tea in Europe and Bunji Itoh was awarded an Official Organic Tea Recognition Licence in Germany for two kinds of organic tea! So the other saw a real expedition of ours ride all the way to his fields located at almost 1,000 meters height! Aya Itoh/伊藤彩, his younger daughter, Asami Itoh/伊藤麻実 his older daughter who, besides helping her father, runs her own business at Saiko Chyaen/彩香茶園, Mr. Bunji Itoh/伊藤文治 himself, Mr. Chaminda Jayawardana, a Sri Lankan Tea Merchant and Grower at Lumbini Tea Factory (PVT) Ltd. who had come at the International Tea Event held in Granship, Shizuoka City and who had been invited to join us all by my friend Nahoko Imai/今井奈保子, owner of Teebom Co..
Interestingly enough, except for Mr. Itoh, everyone was fluent in English! 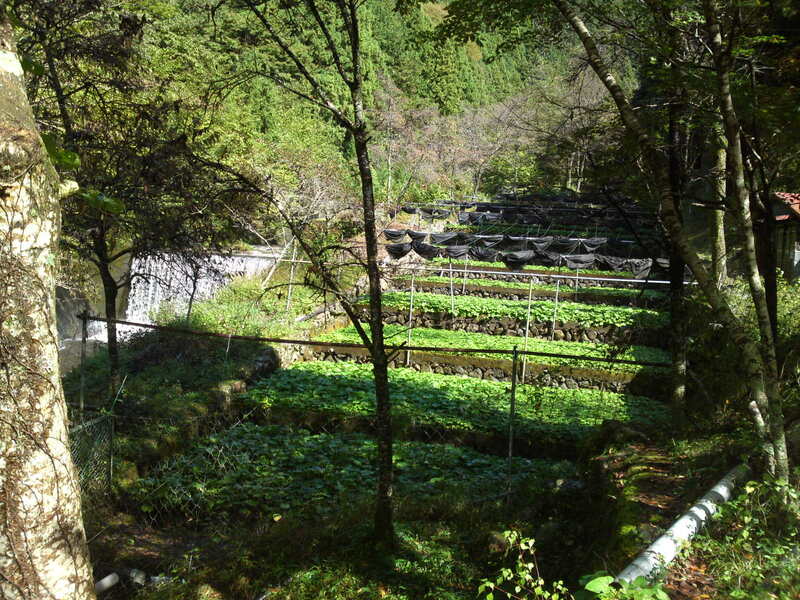 It was actually a great drive along the Abe River and along the wasabi fields! 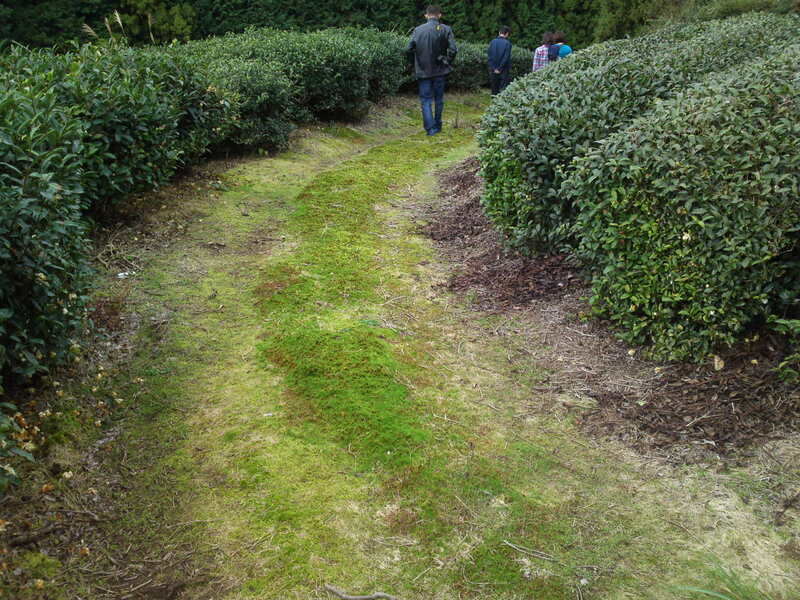 You quickly understood that the culture was organic as the lane sanking between the tea trees was covered with very healthy moss! 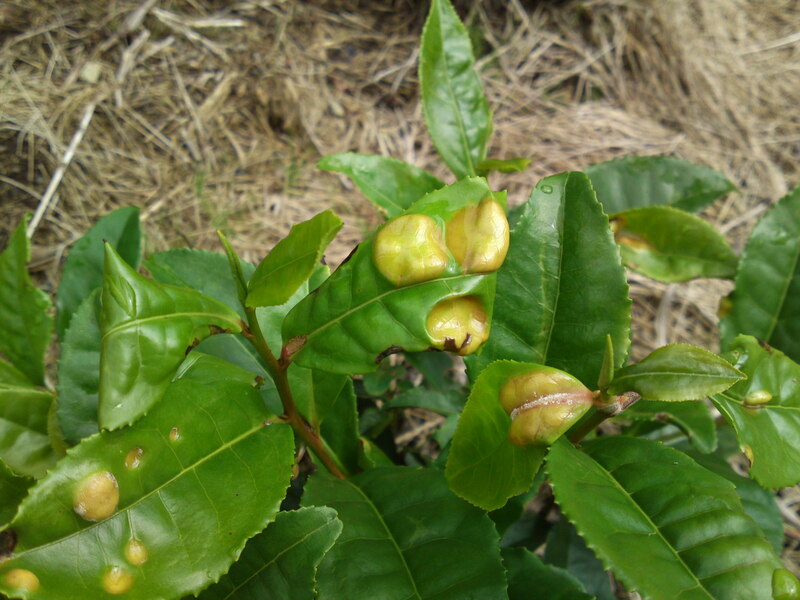 Mr. Itoh grows two kinds of organic tea, Yabukita/やぶきた which is cultivated from grafts and Zairai/在来種 which is grown form the seeds. 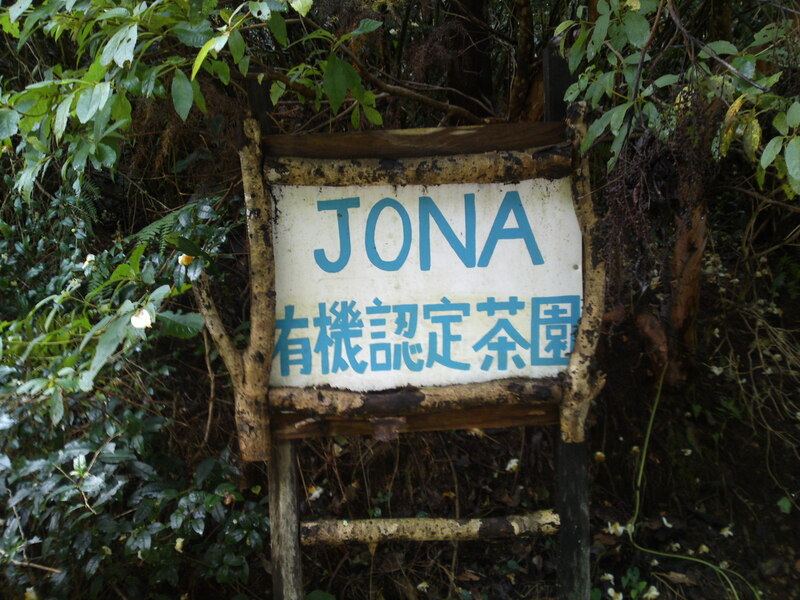 The whole area covers 60 ha at high altitude at foot of the Japan Southern Alps. Stupendous vista from the same fields. 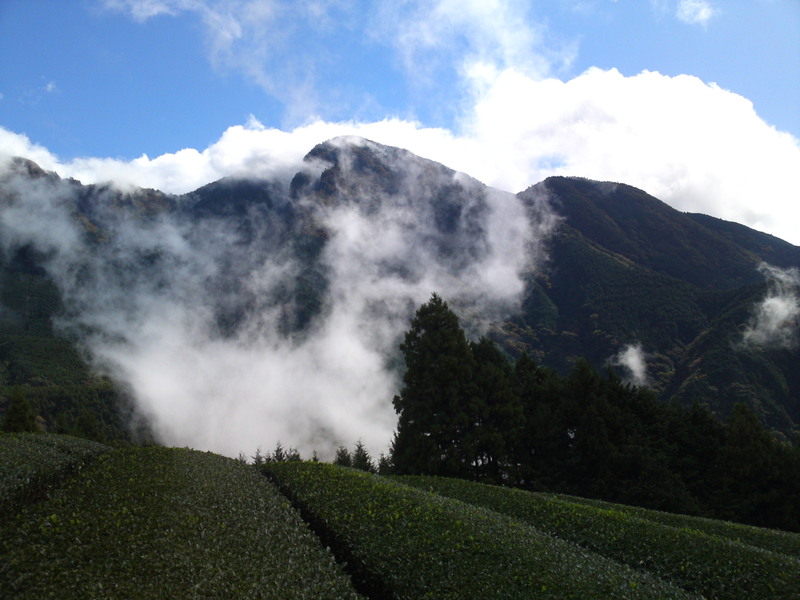 These are not clouds but mist, a major reason for the quality of the tea. Flowers could be seen (they are of the same family as the camelias) blossoming from the base of the trees. 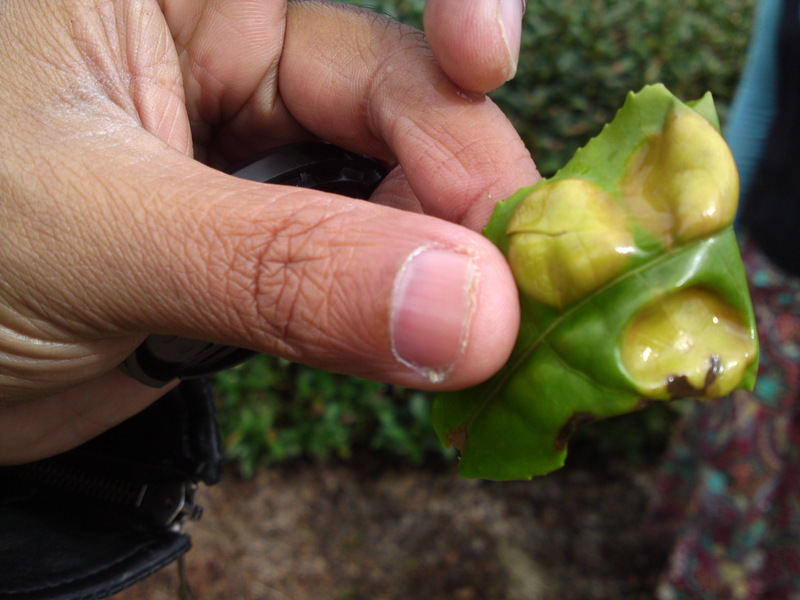 Chaminda remarked that they would never let them grow back in Sri Lanka where leaves are basically picked all year round, whereas here in Shizuoka they are picked only four times a year. 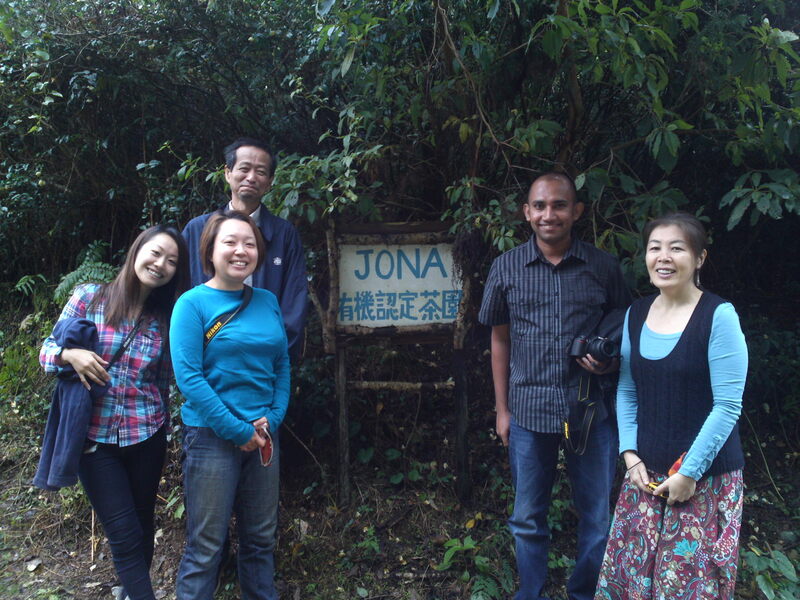 The area is replete with streams and falls providing clear and pure water not only to keep the fields wet but also to keep the insects away (the trees are watered three times a week to make all insects drop to the ground where they will become organic fertilizer!). 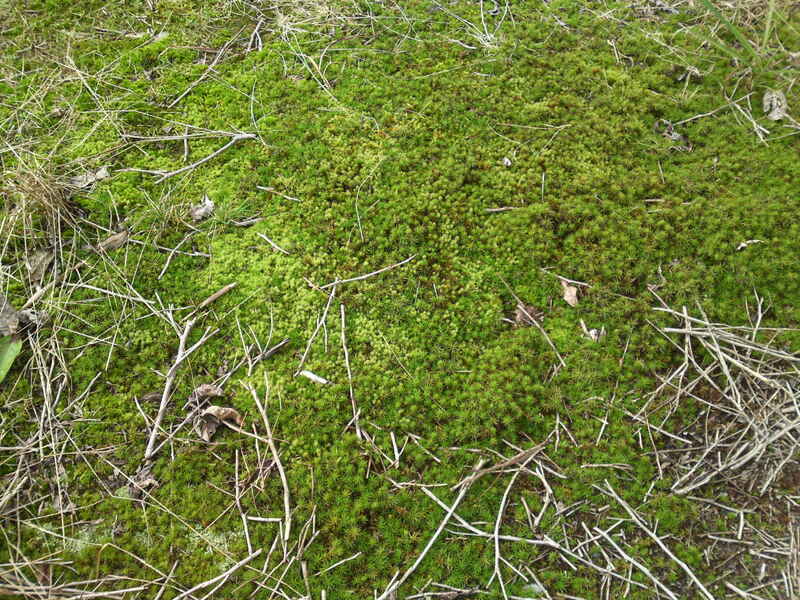 As for fertilizer, Mr. Itoh utilizes only organic matter, mainly composed of grass mowed on abandoned golf courses and let to ferment for three years before being spread between the trees. 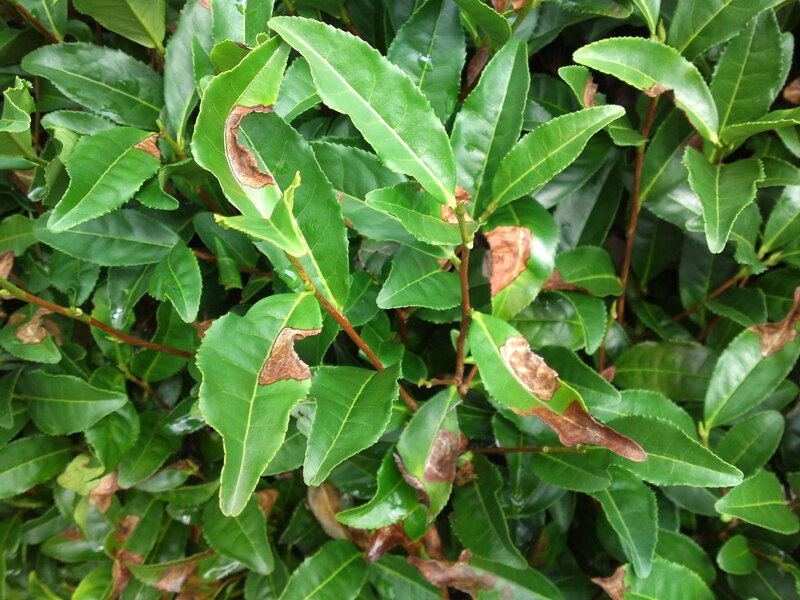 There are plenty of damage on the leaves proving that the culture is organic! 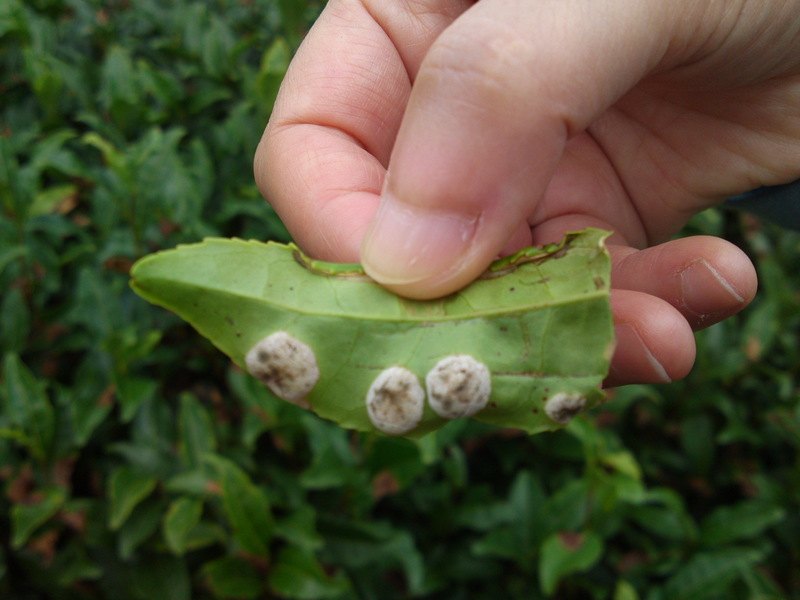 The above picture shows downy mildew/炭素病. All these problems have to be taken care of in a natural manner. No wonder a lot of farmers opt for the easy way. 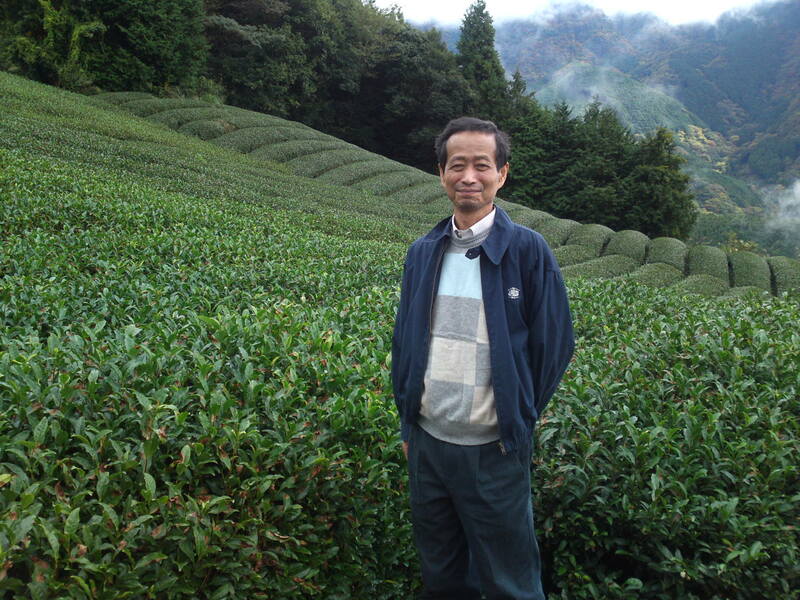 But although Mr. Itoh grows other tea with a minimum of pesticides and artificial fertilizer, he believes he is on the right path with organic tea! But as I need another visit to properly report on the manufacture it will have to wait until the next article! 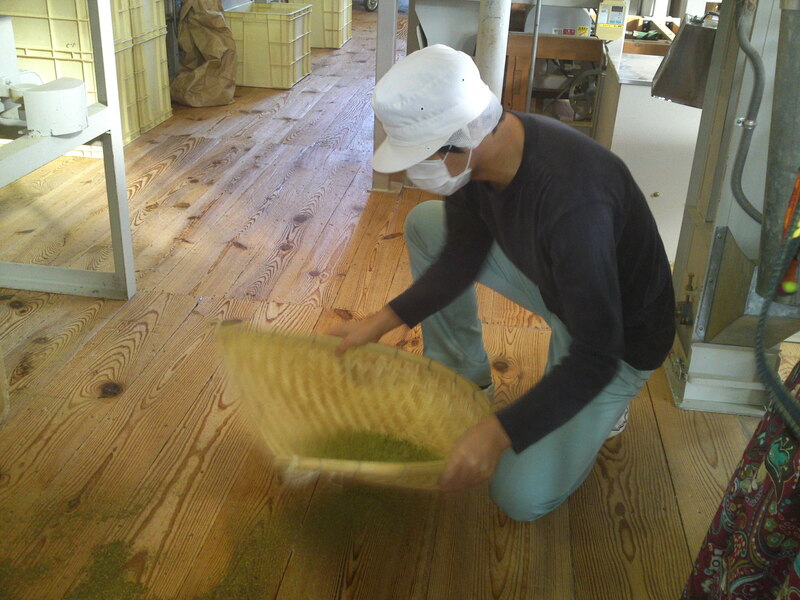 Previous PostFor your Dining Room: Tansu/Japanese ChestsNext PostWasabi: A Visit to Its Birthplace in Shizuoka!